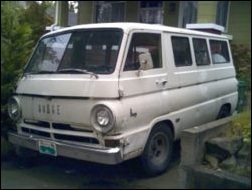 Dodge A100 Van – iDallas! I’ve been seeing a lot of these compact Dodge A100 vans from the 1960s around town and increasingly I’ve been finding myself staring at them as I pass. There’s something just so… beautiful… about the way they sit there. The round headlights and taillights. The way the body hangs over the tires just a bit. The large windshield and steering wheel… mmmmm. This is weird because I’m not really an old car kinda guy. I appreciate the beauty of the machinery but I usually ultimately prefer the modern convenience and technology, and even the aesthetics, of newer cars. I also am very definitely not a car fixit person. I don’t like to get dirty. So, just what is it about this icon of the American past? Is it just that I always wanted to be able to ride along in the Mystery Machine with Scooby and the Gang? I just don’t know. For now I’ll just have to be content ogling them as I pass in the street. Maybe someday I’ll have one of my own, though! That thing has “Dreamhost Company Limo” written all over it! Raped? I guess that’s one way to look at it. And it’s news to me that one random blog could be considered ‘the media’. That guy seems to be up to no good–and he’s getting a hard time from the brighter Digg members in the comments section. Check him out at elliott.wordpress.com as well, having trouble there too (read the comments in the “Yanked” post). Yeah, I think ultimately the whole thing was a misunderstanding. DreamHost didn’t communicate very well what our problem with the situation was and that allowed it to boil up into a bigger issue. Thanks to the Digg.com we all know and love, it’s now somehow ‘news’ that one customer is disgruntled with one company. That’s the first time I’ve seen someone think it’s a good idea to spam the personal blog of someone that owns the company that is hosting the site being spammed… basically begging for money to sponsor a site that lacks any real content except for a line saying that you can’t go into detail about your ideas because you don’t have a lawyer. Hey, Dallas, I don’t have any ideas, but if you throw a bunch of money at me, I promise to consider sharing them with you when I do have them, assuming that I have a lawyer that says it’s okay. Woo hoo! I’ll be rich! Okay, I better go spam Google now and see how much they’re in for. People need to do what they can to get their ideas rolling. I can appreciate the self-motivation and drive Jesse seems to have. DreamHost isn’t really in the business of investing in other peoples’ ideas, though. We’ve got too many of our own that we don’t have the time or money for, already. Seeing the result of your “thinking” – I wouldn’t take it as a compliment. I’d also say the more you post, the less you help your cause. You should be paying Dallas for advertising on his blog, rather than begging for money from him like a bum.